The Federal Reserve is already supporting the economic recovery by maintaining an extraordinarily accommodative monetary policy, using multiple tools. Should further action prove necessary, policy options are available to provide additional stimulus. Any deployment of these options requires a careful comparison of benefit and cost. However, the Committee will certainly use its tools as needed to maintain price stability–avoiding excessive inflation or further disinflation–and to promote the continuation of the economic recovery. That was the hint for QE2 and markets reacted accordingly: Long rates rose, the stock market went up ,the dollar down and inflation expectations increased. Those movements, however, were short-lived because there was no specified goal or target to guide monetary policy. When significant financial stresses first emerged, in August 2007, the FOMC responded quickly, first through liquidity actions–cutting the discount rate and extending term loans to banks–and then, in September, by lowering the target for the federal funds rate by 50 basis points. 1 As further indications of economic weakness appeared over subsequent months, the Committee reduced its target for the federal funds rate by a cumulative 325 basis points, leaving the target at 2 percent by the spring of 2008. Yes, it did respond quickly, but just to avert a repeat of the banks “falling as dominoes” as in the early 1930s. As late as late July 2008, the view was that monetary policy would soon have to be tightened! In fact, the Fed´s response to economic developments from the start of this recession revealed that policymakers were decidedly cautious. Furthemore, given the central role of expectations of future central bank policy in the monetary transmission mechanism, an easing or tightening of policy can consist of any action, or inaction, by the Central Bank that alters the public´s expectations. 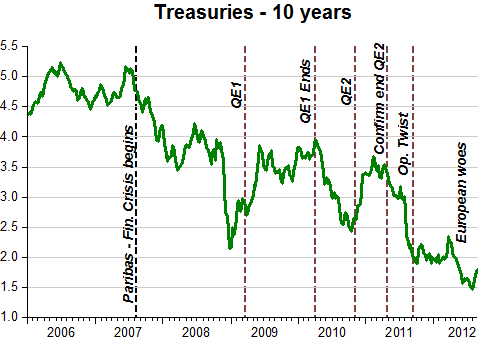 From that perspective it seems that monetary policy actions from late 2007 into 2008 could be classified as ‘irresponsible tightening’! Despite the easing of monetary policy, dysfunction in credit markets continued to worsen. As you know, in the latter part of 2008 and early 2009, the Federal Reserve took extraordinary steps to provide liquidity and support credit market functioning, including the establishment of a number of emergency lending facilities and the creation or extension of currency swap agreements with 14 central banks around the world. Just shows that the level of the policy rate is a poor indicator of the stance of monetary policy. It can be terribly tight even if the rate is zero! Unfortunately, although it is likely that even worse outcomes had been averted, the damage to the economy was severe. The unemployment rate in the United States rose from about 6 percent in September 2008 to nearly 9 percent by April 2009–it would peak at 10 percent in October–while inflation declined sharply. As the crisis crested, and with the federal funds rate at its effective lower bound, the FOMC turned to nontraditional policy approaches to support the recovery. As the Committee embarked on this path, we were guided by some general principles and some insightful academic work but–with the important exception of the Japanese case–limited historical experience. Where´s all the conviction Bernanke demonstrated in his recommendations for Japan back in late 1999? He could certainly have acted much more forcefully as Fed Chairman several years later. Early in my tenure as a member of the Board of Governors, I gave a speech that considered options for monetary policy when the short-term policy interest rate is close to its effective lower bound.31 I was reacting to common assertions at the time that monetary policymakers would be “out of ammunition” as the federal funds rate came closer to zero. I argued that, to the contrary, policy could still be effective near the lower bound. Now, with several years of experience with nontraditional policies both in the United States and in other advanced economies, we know more about how such policies work. It seems clear, based on this experience, that such policies can be effective, and that, in their absence, the 2007-09 recession would have been deeper and the current recovery would have been slower than has actually occurred. Unfortunately the conduct of monetary policy, by allowing spending to take a plunge, has strongly contributed to the fiscal and financial risks in place. Back in 2010 he ‘hinted’ on QE2, this time around Bernanke has all but confirmed a new round of ‘policy accommodation’. But has he learned that for that to be really effective he has to state a goal or target? Good to see that the idea is gaining traction. 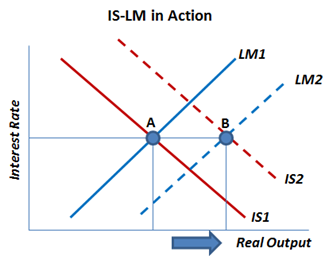 Update 2: Scott Sumner takes on the “low rates=accomodative monetary policy” syndrome. Update 3: David Beckworth on Woodford´s endorsement. Government Policies and the Delayed Economic Recovery examines the reasons for the weak recovery from the recent US recession and explores the possibility that government economic policy is the problem. The book concludes with key recommendations to help restore prosperity, including a broad-based tax reform that cuts tax rates, equalizes tax treatment across all types of capital, broadens the tax base, confronts entitlement spending, and, more broadly, reduces government spending as a percentage of GDP, as well as reforming unemployment benefits to reward job acceptance and accumulating human capital. The implications are clear: the future of both the American and the world economy is riding on an excellent diagnosis of the problem and appropriate changes in policy. A unified explanation of the crisis is provided by monetary policy: It was responsible for the “depth” of the fall and is also behind the so-called “weak recovery”. Following the collapse of Fannie Mae (FNM) and Freddie Mac (FRE), Ben Bernanke’s Congressional testimony last week had Fed watchers predicting interest rates would remain flat, or possibly fall, by the end of the year. But surging share prices last week and tough talk from two FOMC board members has delivered an expectations U-turn. According to interest rate futures, investors had priced in a 42 percent chance of a 2008 rate hike following Bernanke’s testimony. But after falling oil prices and not-as-horrible-as-expected earnings from banks drove stocks higher through Thursday, a hike by year-end had been fully priced in by finicky investors. All of this has helped push up the expectations of higher rates even further with a hike by October almost fully priced in at 90 percent. What it in fact helped push was the “ball over the edge”. You want more money? But I won´t give it to you! 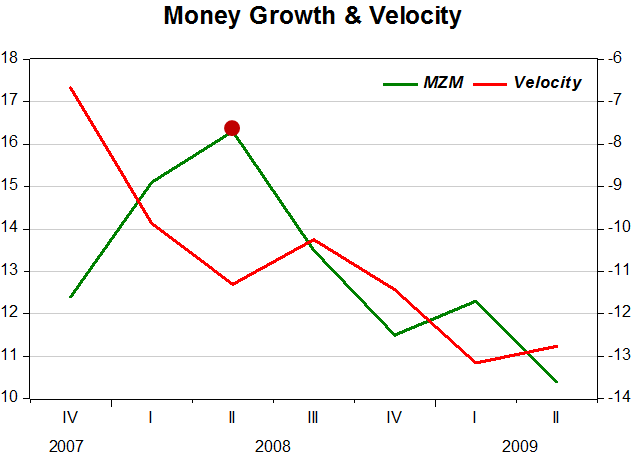 So while velocity was tanking (money demand soaring) the Fed thought it proper to pull in supply. Yes, typically. But that doesn´t mean it´s in any sense “automatic”. 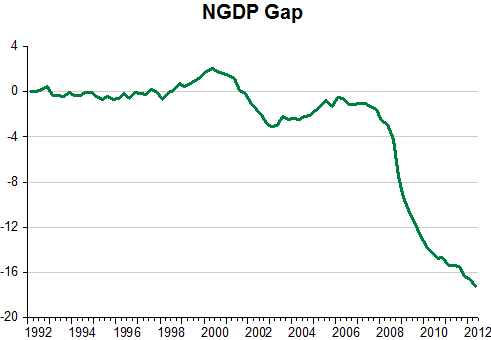 The powerful rebound “typically” observed in RGDP is “typically” the result of the Fed cranking up monetary policy (which is not about “low” interest rates”) driving spending (NGDP) up forcefully. 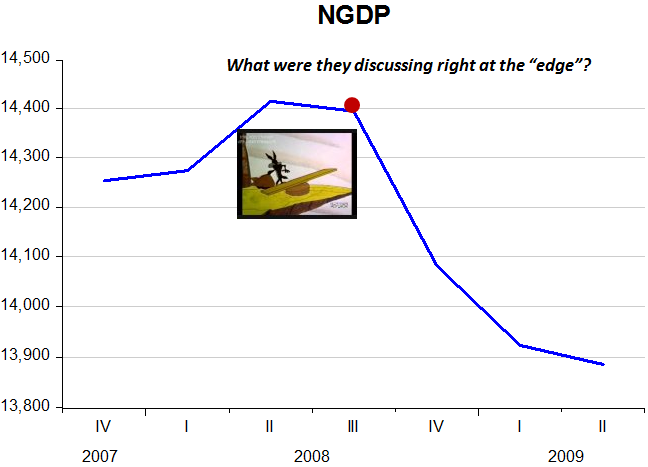 The chart clearly illustrates why there´s been almost no RGDP rebound at all. Just compare spending growth in the two instances. Bernanke claims money has been “extraordinarily accommodative,” based on the low interest rates and fast money supply growth. Thus he simply walks away from his 2003 definition of the stance of monetary policy. And no one in the press has called him on this inconsistency. He has not walked away from his much more well-known denial of “liquidity traps” as preventing monetary stimulus, as that would make him look like a fool. Instead he’s consistently argued that the Fed could do more, but is held back by certain unspecified “risks and costs” of further stimulus. This approach to the problem is wrong on all sorts of levels. There are no costs and risks of keeping expected NGDP growing along a 5% track, level targeting, all the “costs and risks” come from missing the target. 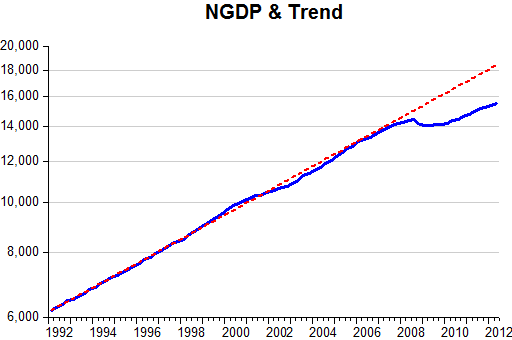 To take just one example, the ultra-slow NGDP growth after mid-2008 drove nominal rates to zero, and greatly boosted the demand for base money. This forced the Fed to buy lots of assets, exposing them (allegedly) to risk of capital losses on those assets. But that “risk” is caused by tight money, not monetary stimulus. Even worse, it’s not really a risk at all, as the Fed is part of the Federal government. Any losses to the Fed from falling T-bond prices are more than offset by gains to the Treasury. Indeed that’s why inflation has traditionally been viewed as a boon to government coffers. Monetary policy should do what it can to support the recovery, but there are limits to what monetary policy can accomplish. 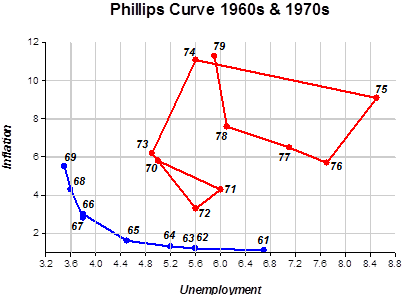 Monetary policy cannot directly control the unemployment rate. It can only foster conditions in financial markets that are conducive to growth and a lower unemployment rate. At times, significant obstacles can get in the way. … large-scale asset purchases can be effective. But our experience with these programs is limited, and as a result, they justify more analysis. For example, as the structure of interest rates has moved lower over time, it is possible that future large-scale asset purchase programs will yield somewhat smaller interest-rate declines than past programs. A related issue to evaluate is whether further reductions in longer-term interest rates would stimulate economic activity to the same degree as they have in the past. The bottom line is this: I am supportive of actions that provide economic benefits with manageable risks. The FOMC’s policy actions to date have been important economic stabilizers and have acted to support the expansion(!). Yet today, we still find ourselves in a challenging economic environment – one in which we continue to rely on nontraditional policy tools. These new tools come with benefits and with risks … and we must constantly weigh both in our efforts to meet our dual mandate of maximum employment and stable prices. I´m always surprised by FOMC participants concentration on interest rates and how the “programs have been successful in lowering them” and thus providing support to the expansion. It´s just the opposite as seen in the chart below. 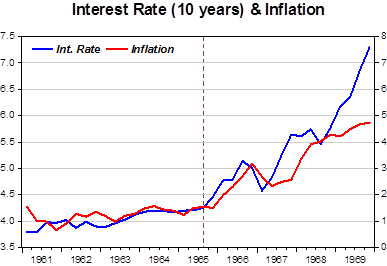 Every time a new “program” was announced or implemented, interest rates rose. And at the end of the programs they fell! You see that rates fell when the financial crisis began with the Paribas announcement in early August 2007. With Operation Twist the effect was more muted: interest rates only stopped falling. What they should want was a “program” that would give indications that the Fed was set in getting the economy back up. Interest rates, stock prices and inflation expectations would all go UP! In a post today Jim Hamilton comments on the Fed´s balance sheet. Some have criticized the Fed’s emergency lending on the grounds that the Fed took all these extraordinary actions and yet the economy still performed very badly in 2008:Q4 – 2009:Q2. I think this misses the point. I don’t believe that it was ever within the Fed’s (or anyone else’s power) to bring the economy quickly back to full employment. Instead, the purpose of the Fed’s emergency lending was to prevent a very bad situation from becoming even worse than it needed to be. The evidence we now have suggests that the Fed indeed accomplished exactly this. These measures, too, have been criticized on the grounds that, despite QE1 and QE2, the economy continues to disappoint. And here again, I think the critics have missed the point. I again maintain that it is not within the Fed’s power today to bring the economy quickly back to full employment. I nevertheless also believe that deflation– an outright decline in wages and prices– would make our problems even worse. For this reason, I have been a supporter of the Fed now moving ahead with QE3, though my expectations for what this will actually accomplish are low. Let me understand. By its monetary policy mistakes the Fed has the “power” to crash employment but is powerless to take corrective monetary policy actions? And furthermore, Jim Hamilton has low expectations for what can be accomplished by the Fed´s actions! He´s not wrong to have low expectations, because so do I, unless the Fed undertakes QE3 within a NGDP Level Targeting framework. The chart shows that back in the early 1980s Volcker got things going after the recession by driving nominal spending much higher, something that Bernanke ‘refuses’ to even try after allowing it to crash after mid-2008! 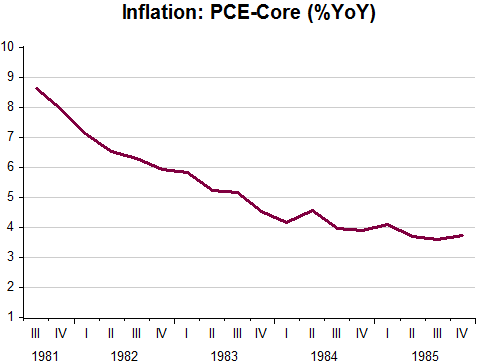 And back then, inflation continued to trend down even after spending ‘shot-up’. 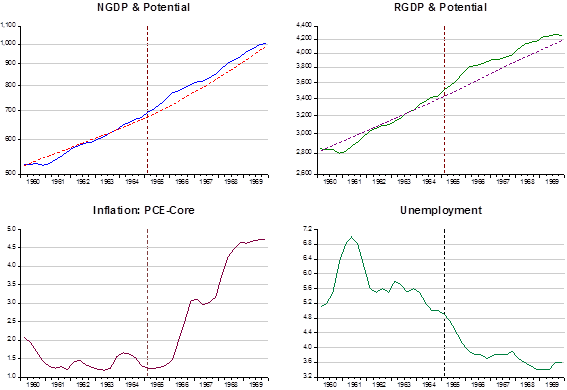 But Bernanke has strong longstanding views, both on inflation targeting and the credit channel (see here for a primer). Reporters immediately latched onto Mr. Hubbard’s comments as a sign of internal campaign disagreement, given that Mr. Romney has publicly dismissed the idea of re-appointing the Fed chairman. The better explanation is that Mr. Hubbard, the former chairman of the White House Council of Economic Advisers under George W. Bush, covets the Fed job for himself. What was he supposed to tell his questioner, “Fire Ben and hire me”? Mr. Romney set the record straight Thursday, telling Fox Business News that he wants a “new person” to fill the Fed chairmanship who is focused on “monetary stability that leads to a strong dollar.” That’s solid advice for whomever takes the job next. That´s quite the opposite of the monetary stability we want. Federal Reserve Chairman Ben Bernanke, in a letter responding to questions posed by U.S. Rep. Darrell Issa (R., Calif.), chairman of the House oversight committee, defended actions the Fed has taken to support the economy and said there is room for the Fed to do more. “There is scope for further action by the Federal Reserve to ease financial conditions and strengthen the recovery,” Mr. Bernanke wrote in a letter dated Aug. 22, a copy of which was obtained by The Wall Street Journal. The Fed’s “Operation Twist” program—buying long-term Treasury bonds and selling short-term securities—is still “working its way through the economic system,” Mr. Bernanke said. The program was first launched in September 2011 and in June 2012 was extended through the end of this year. One option is what could be called the “New Gold Standard,” the market-based targeting of nominal GDP. And that has worked reasonably well even if it was not by design. If it were, it´s likely the late 90s early 00s instability would have been avoided and surely Bernanke´s disaster wouldn´t have materialized.